Nana Akua Addo may be a random actress in the Ghanaian movie scene but when it comes to attending red carpet events, her style is always incomparable. I mean, what better way to attend the 2019 Glizt Africa Ghana Women Of The Year Honours other than dressing like a queen? 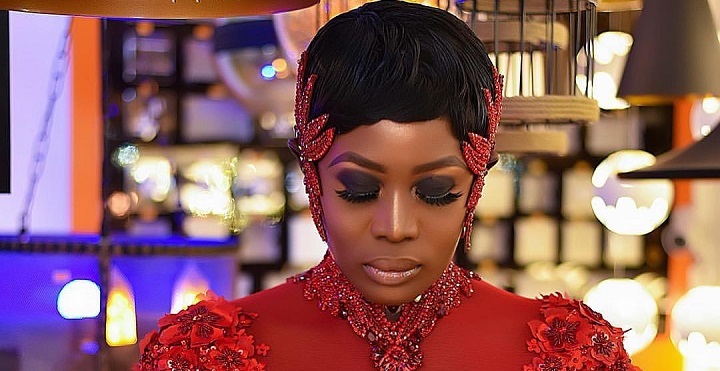 Well, that was Nana Addo’s aim and the actress turned heads at the event yesterday wearing an ethereal red gown, featuring sparkling and dreamy embellishments in floral shapes. The floor-grazing number also featured long sleeves, generously plunging neckline, and it hugs her figure perfectly, which Nana was happy to show off to full effect. The beautiful piece of art was not only breathtaking, but it also comes complete with sophisticated ear and neck accessories, which Nana finished off with a glam makeup.